SEOUL, Dec. 22, 2013 — In less than three weeks, LG Electronics (LG) will be showcasing its latest audio video lineup at the 2014 International Consumer Electronics Show (CES) in Las Vegas. The premium selection of products includes the latest iteration of the much acclaimed, space-saving SoundPlate (Model LAB540W), innovative Wireless Audio System (Model NP8740) and the sleek, aesthetically striking Sound Bar (Model NB5540). 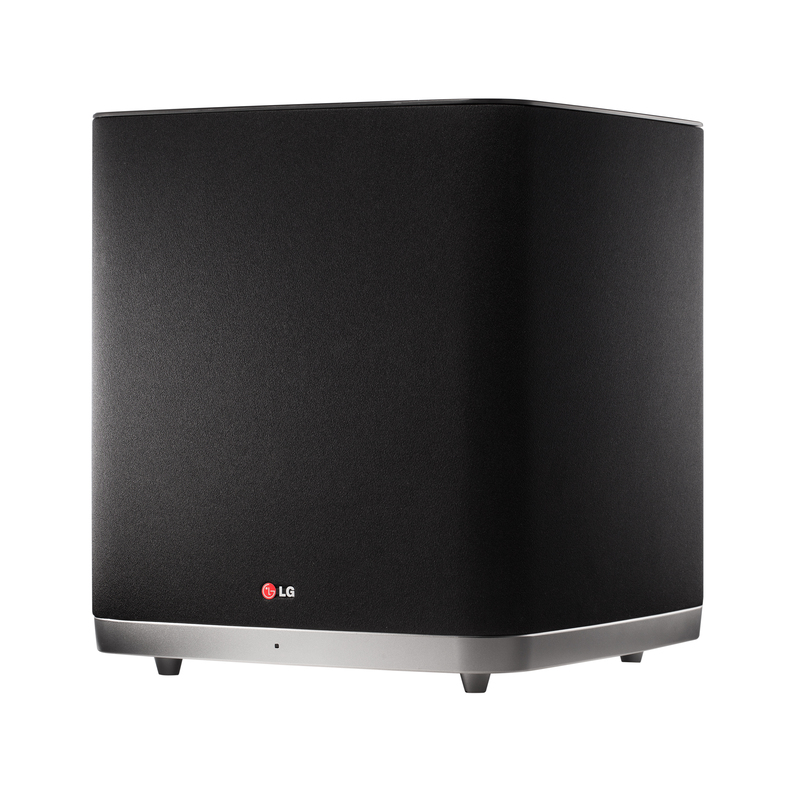 These systems, along with a number of other head-turning products,offer rich, deeply satisfying sound along with the plethora of convenient smart connectivity features that make LG’s systems so versatile. The LAB540W, better known as the SoundPlate, is the latest arrival to a new category of slim audio devices to accompany today’s flat screen TVs. Rising a mere 39.5mm above its base, this stylish device is impressively space efficient and can be placed directly underneath a variety of 32- to 55-inch TVs to minimize clutter. The new model is equipped with a robust 4.1 channel, 320 watt sound system and an external wireless subwoofer. This compact unit projects full-bodied audio in multiple directions, delivering an immersive, breathtaking auditory experience. 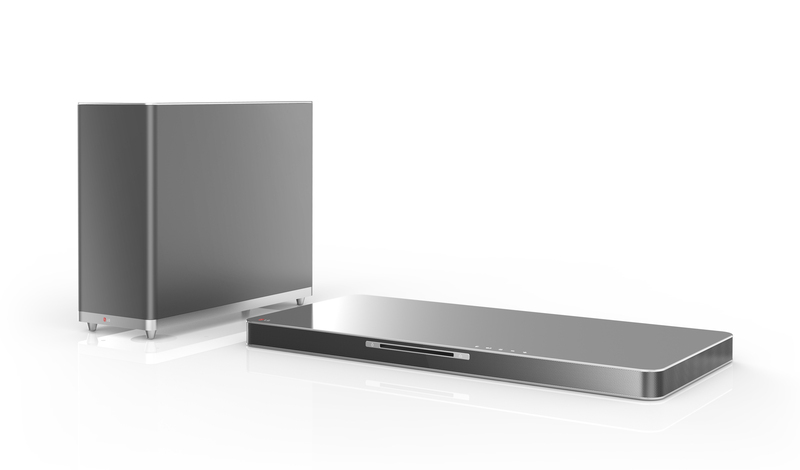 The SoundPlate also serves as a connectivity portal and features a built-in 3D Blu-ray player along with LG Smart TV functionality, transforming any flat screen TV into a Smart TV with powerful sound performance. Additionally, customers can use a second screen device to wirelessly stream content to the LAB540W overa local Wi-Fi network or via Bluetooth. 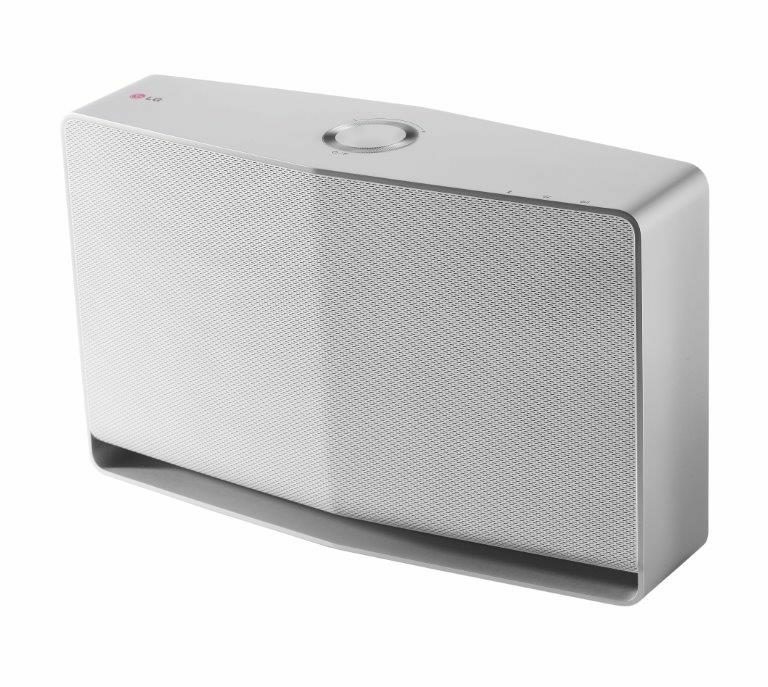 LG’s Wireless Audio System, winner of a 2014 CES Innovation Award,gives users the power to choose from virtually limitless home audio configurations. This is possible because the NP8740 runs the latest mesh network technology, which includes dual band Wi-Fi support (2.4/5GHz) to deliver high quality streaming music throughout the home. 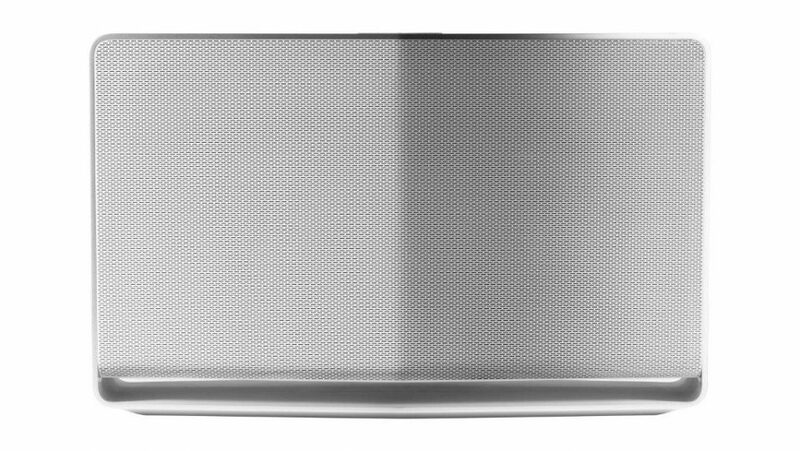 Each wireless speaker not only produces rich sound with clarity and depth, but also sends the sound out in multiple directions. Several speakers can be set up in any combination of rooms, connecting an entire house under a single system. 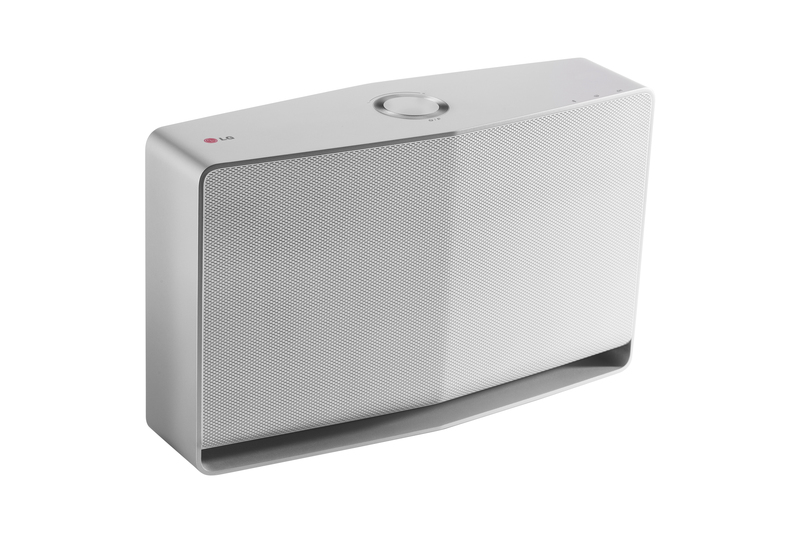 The embedded mesh network technology also makes it possible to choose between playing the same song throughout the home (Party Mode), or different songs through each speaker (Personal Mode). What’s more, the NP8740 can connect to other audio systems for an integrated experience with greater output and control. The Wireless Audio System allows digital audio collections to be accessed without a home network while a downloadable app turns a smartphone intoan easy-to-use master control unit. The interface even lets users seamlessly stream audio from online sources. Overall clarity is enhanced by a dual-tweeter arrangement and 24 bit/192kHz offers studio-like sound quality. LG’s numerous Sound Bar options are the perfect complement for a wide variety of TV sizes and styles.The NB5540, for instance, is a beautiful match for modern thin-bezel TVs thanks to its minimalist design and polished dark silver finish. A particularly stunning accompaniment to LG’s premium flat screen TVs, the system features 4.1 channels and 320 watts of powerful output. Despite its low profile body, the NB5540 delivers rich, room-filling audio thanks to two forward-facing and two rear-facing channel configuration. The unit also employs a Hi-Fi DAC and Analog Class D amp to ensure superior HD audio quality, minimizing the loss of detail and producing clean, natural sound. The NB5540 supports HDMI with Audio Return Channel (ARC), enabling it to connect to a TV with a single cable. The system is also Bluetooth enabled, facilitating wireless audio streaming from smart devices such as a Smart TV or smartphone. The NB5540 can be wall-mounted or placed anywhere in the room, giving homeowners an array of installation options. LG’s audio visual products have a track record of winning awards and accolades. The Micro Audio System (Model CM3430) was an EISA 2013 Award recipient, the NB5530A Sound Bar was honored with a Red Dot Design Award and the NB4530A Sound Bar received an iF Design Award along with five stars from What Hi-fi for its excellent features and ease-of-use. The 2014 lineup includes a number of other premium products to deliver convenient wireless connectivity and an unforgettable auditory experience. 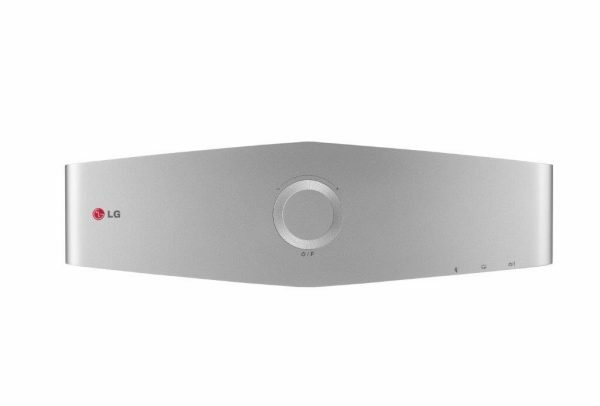 Visitors to LG’s booth at CES 2014 (Las Vegas Convention Center, Central Hall #8204) from Tuesday, January 7 through Friday, January 10 will have the opportunity to see LG’s newest Smart Blu-ray players, home theater systems, Pocket Photo 2.0 and the Mini AUDIO for themselves.